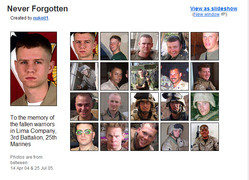 Unfortunately, Corporal James McCauley in Iraq has had to update his Flickr set of fallen comrades from L Co., 3rd Bn, 25th Marines, with 11 new photos. He also recently updated his blog. Here is a screen capture of the index of the Never Forgotten set being maintained by McCauley.